A biker rolls in for a rare spring thaw Friday the 13th. More photos below. March 13, 2015 It's been a long cold winter, and the bikers are finally back on the road. 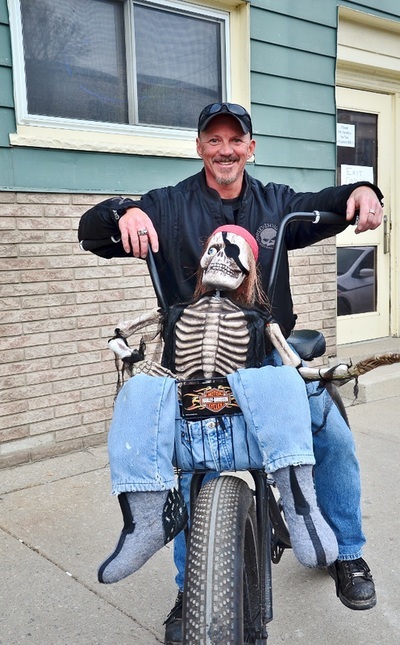 They ride around on everything from Harleys to mopeds – even on fat-tired bicycles with pirate puppets in the front basket. That’ll be Bill Hutch, owner of Hutch's restaurant in Hamilton, who wants to avoid a DUI but still join in on the fun. 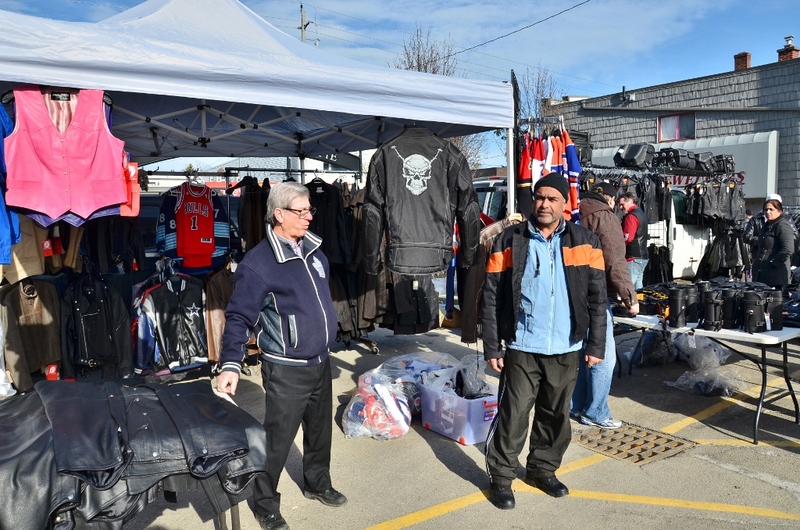 Couples, friends or entire families, young or old, hip or shopworn, open and smiling or faces hidden behind black bandanas, all throng the sidewalks of King Street East with its many shops and eateries. Since 1981, every Friday the 13th is biker day in Port Dover, Ontario, a formerly sleepy beach haven nestled on the shores of Lake Erie. On this date, with temperatures climbing to a balmy 9° C, several thousands of visitors and hundreds of bikes will have passed through from a 100 miles around the area. It'll be the last Friday the 13th until November for this year. Motorcycles line the streets as their owners dart in and out of stores selling goods such as T-shirts emblazoned with skulls, crossbones and the date of doom. 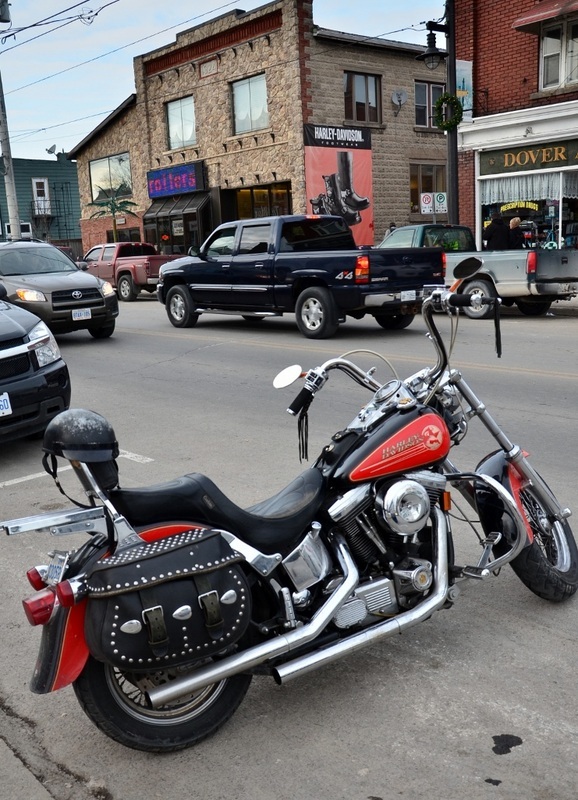 When a Friday the 13th happens in the summer, tens of thousands of motorcycles converge on the beach town, which can swell with several times as many travelers from all parts and directions, from New York to Montreal, keeping the Windsor-Detroit border crossing so busy extra staff is often on call for the day. 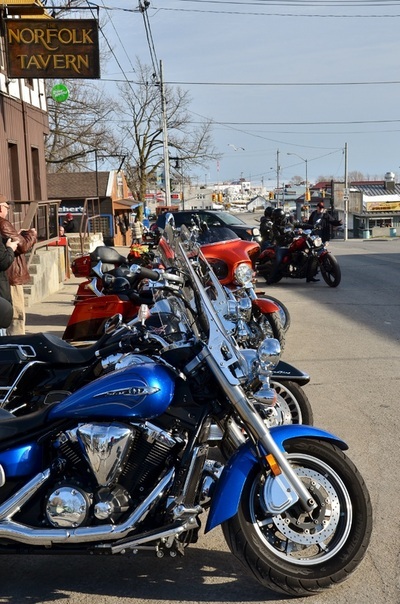 The biggest crowd in Port Dover history came to town on June 13th, 2008, with an estimated 40,000 bikes and 150,000 visitors. Numbers like these are an overwhelming jump from the usual population of 6,387 recorded in 2011 statistics. 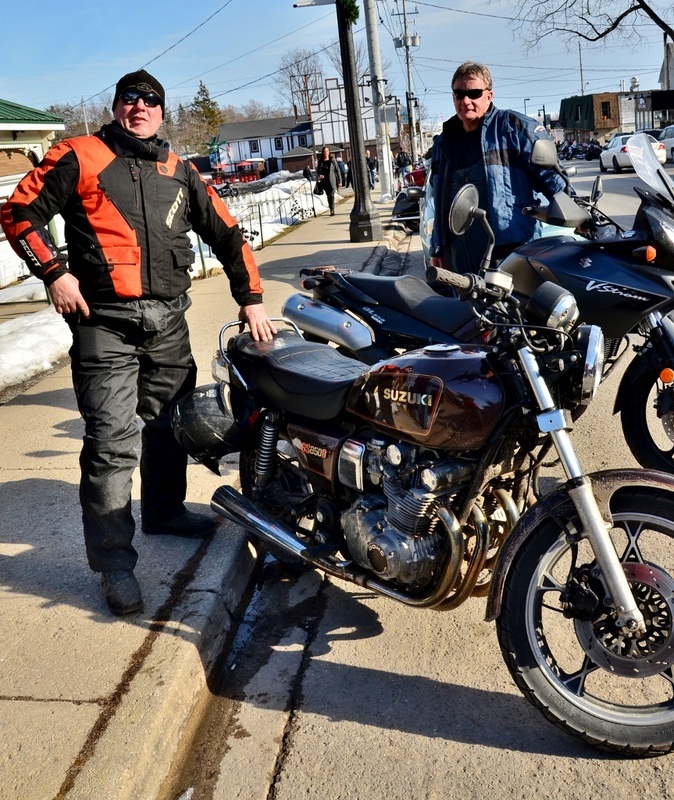 Several of the riders here on this first taste of spring have been coming around since the early years. Larry, a Brantford resident, is one of them. He compares the present tradition to fishermen and sailors coming in on their tugboats to defy the fateful date in the past. 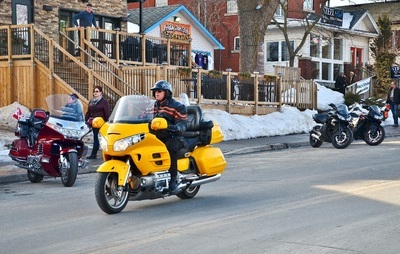 Since the milder weather is a welcome change from the frozen curse of this year's February run, when it was -13° C, Larry expected more riders to show up today. He notes the sparse if visible crowd is a far cry from the “crazy” summer gatherings. Predictably, local businesses see the travelers as a welcome shot in the arm. Mindful of the economic bonanza, the mayor has an official welcome message online for the thousands of riders coming in at least once a year. Connie Kosman runs Keleher’s Western Wear, a leather clothing and accessory shop on the main strip, along with her sister Shirley Keleher. They’re usually open only from May to September, but came in from Cambridge to set up especially for the day. The sales are worth it, says Connie. “It’s like night and day,” Shirley confirms. Likewise, Azeem Anjum, owner of Moma Leathers, drove in from Mississauga to take advantage of incoming customers on two wheels. 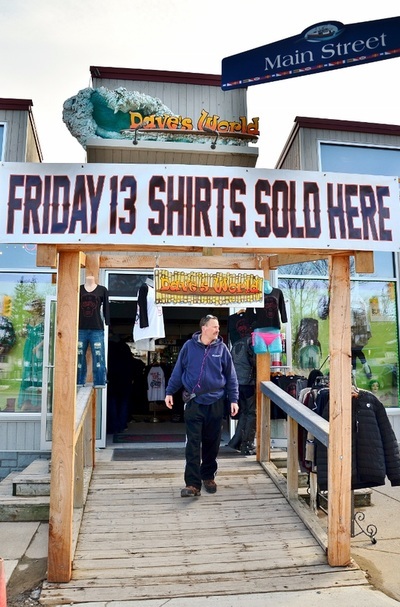 He’s been setting up on Friday the 13th in Dover for the past 20 years and feels the hundred or so who’ve shown up to shop today have made his effort worthwhile. 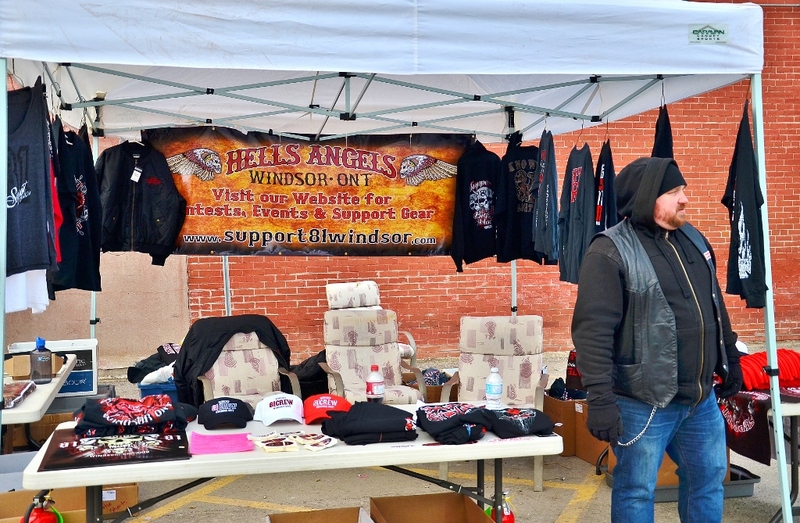 Even the Windsor chapter of Hell's Angels has jumped in on the action, with a booth in a parking lot turned market square. They showed up in February, when only six to ten bikes dared to venture in. “We're selling the brand,” points out the biker behind the table, ever the savvy denizen of merchandising, complete with business cards and a website to help hawk the posters and T-shirts. It probably doesn't hurt “the brand” if police like to keep a close eye on the booth. “They harass us all the time,” avers the lead hand, whose name I confess I didn’t ask. A cursory search reveals little for law enforcement to worry about. 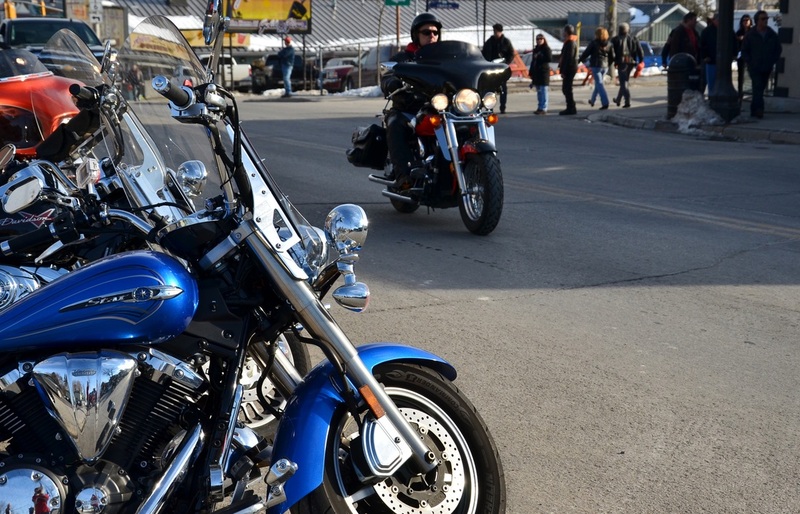 Bikers here are more often victims of collisions with cars than perpetrators of crime. One marked police car and one marked van meander down the main street in the space of two hours, but Larry points out summer crowds attract many undercover police officers and an equal number of plainclothes counterparts. Pubs and bars are doing a brisk business, even if the bistros and similar eateries stay dark and the local apothecary, with its pastel leaf green retro decor, sees little traffic. The Norfolk’s cups runneth over, its upstairs turning away patrons and its downstairs venue already half full before 6 p.m. Up the road, Angelo's is humming. This is the spot where the tradition was born, with local rider Chris Simons and about 25 of his buddies, when the place was called the Commercial Hotel. It was Friday the 13th, and they had such a good time they decided to do that again. Today, customers line up at the bar. Jessie is one of the several servers on hand to handle the rush. He couldn’t be happier: “Friday the 13th is awesome,” he grins. Snow, ice, gawkers, cops and all. Like this article? See my report on Detroit from last spring (scroll down for English) and another on hiking in Arizona.